Slake durability is a simulated weathering test to determine abrasion resistance during wetting and drying cycles of shale and similar soft rocks as used in embankments and other construction-related applications. Samples are alternately tumbled in mesh drums through a water medium and oven-dried for two cycles. The percent loss of mass is referred to as the slake durability index. 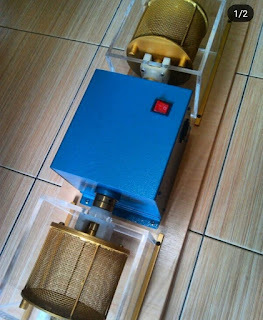 This apparatus consists of a base-mounted, double-ended motor drive unit which rotates two 140mm dia. x 100mm (5.5x3.9in) sturdy wire mesh drums at twenty revolutions per minute in included water tanks. The water tanks have built-in, quick-release drive units. Corrosion resistant drums are constructed of 2mm opening mesh with solid end plates. The unit is capable of turning four drums simultaneously at the specified rpm, and is mounted on a 4ft (1,219mm) long base suited to the addition of the added drums in series with the first two. An additional set of two mesh drums and two water tanks are available as AG34-108/SAA-30. To facilitate sample preparation, order additional mesh drums as AG34-108/SAA-31.